If I DON'T CARE wasn't the very first stab at songwriting by JOEY, it was among the twentyish hopeful's very earliest attempts. According to the oft-repeated legend, his younger brother MICKEY LEIGH stripped an acoustic guitar down to just the low E and A strings, making the strumming of rudimentary melodies with approximated barre chords simpler for his novice sibling. Shortly afterward, he then taught his older brother the basics of his favorite song: ALICE COOPER's I'm Eighteen. The following day he was surprised to find that JOEY had written a new tune by shamelessly distorting the changes he'd learned, and adding a few phrases of childish-- but stunning-- lyrics. In time, the blunt composition would find a comfortable home inside the primitive outsider rock of the RAMONES. Transposing the source melody from the original's E-C-D to the more power chord friendly A-F-G (and unsurprisingly ignoring any minor shadings), JOEY had unthinkingly stumbled onto a foundation he would utilize continually in decades to follow. Eventually the framework would dominate his songcraft, and become one of the stock melodic tactics the band wielded with regularity, along with 1-4-5, and its related 'doowop' changes. Later applications would include some of their most famous material-- I JUST WANT TO HAVE SOMETHING TO DO, PET SEMATARY, WE WANT THE AIRWAVES, I BELIEVE IN MIRACLES, to name only a few. This is not to suggest that all of these songs end up sounding the same. 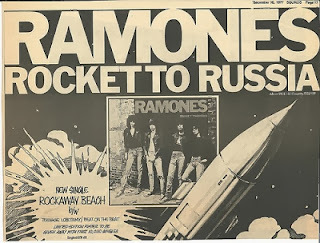 After all, the appearance of I DON'T CARE shortly after HERE TODAY GONE TOMORROW-- another extremely early piece by JOEY built around a similar grouping of chords-- in the running order of ROCKET TO RUSSIA hardly makes any resemblance conspicuous. If anything, it makes their dissimilarity more pronounced, despite their common lineage. Such was the dexterity with which the band tinkered with fretboard patterns. Quickly embraced after the band's formation, I DON'T CARE was amongst the tracks first attempted at the RAMONES' initial 1976 demo session (see I DON'T CARE demo). 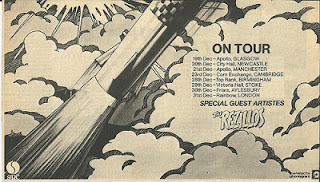 Although steps were taken to beef up the sound for ROCKET TO RUSSIA's official version, including an extra overdub of guitar crunch, in the end it falls into the cache of numbers which might have benefited from LEAVE HOME's heavier production. An almost comedically weak response vocal from DEEDEE detracts considerably, and the effectively affected tone of JOEY's earlier blase performance is not matched. The demo is also pitched a step down lower in G, adding to its sludgier superiority. The unprecedented, understated nihilism of the four sentence lyric ironically brings the band to the verge of self parody, despite the song's prototypical stature. JOEY's unschooled approach landed him onto a title phrase of deeply obvious personal resonance, however, his ceaseless usage of those three words in comparable later material (such as I DON'T WANT YOU and WHAT'D YOU DO) would finally beg the question: Didn't the defensive repetition indicate that he actually cared quite a bit? Still, that here, on perhaps his very earliest attempt, JOEY managed to help codify not only the RAMONES' trademark raw musical approach, but also the bleak humor of their outcast world view, remains impressive. 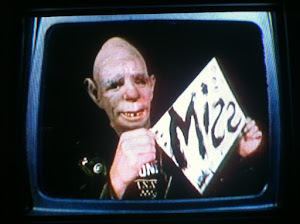 In their disdain for even 'these words,' the RAMONES staked a claim where few bands, even as a joke, would dare to go.